Love your layout - the circles are especially cool! If I won the embossing kit I would use it to make my cards and layouts. I would love to try using them on the metal sheets like you did! Thank you for the chance to win! I love your layouts! It's gets hard with 2 boys to come up with layouts, you always have great ideas. I would love to win the embossing kit. I already have the pen holders of yours and love them. I want to try the embossing sooo bad. clhajnal "at" aol "dot" com. I love the layout! If I won the embossing kit I would be all ready for when I have grandkids!! You can find me on the island! Ok, the look and layout is TOTALLY awesome! How exciting! I would love to win! I am working on a heritage album for my family, I would use it to emboss every page on my album!!! You have the coolest layouts and I love the embossing kit. I really need to order one, but if you pick me then I won't need to! I would make lots of cool layouts for my kiddos in addition to some pretty cool cards. I have all of your marker holders and the are the coolest thing since sliced bread! Thank for your talent!! I have to admit, when I heard about embossing I wasn't too interested UNTIL I started following your blog! What would I do with an emossing kit?? I would emboss everything I could get my hands on!! If I won the kit, I would pull out my cricut more. I need to use that thing for more than cutting a letter here and there. You can find me on the island! Hey Amy...you know it I would love to win your embossing kit!!! I've been holding out, but someday I will surprise you and actually create some thing awesome to show you!! LOL. I love making mini albulms and I think that embossed images would make a real cool statement to the pages. Thanks for the opportunity to win...you're AWESOME! 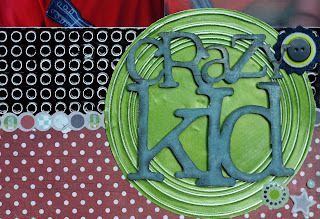 I would love to try out the embossing kit on my scrapbooks and cards. Looks super cool! Amy - YOu are my idol!!!!!!!! One day I'm going to be able to scrap like you!!! I'd use the embossing kit on metal like you mostly. I think it is most fitting for boys! But on vellum too for the wedding album I want to work on. As always - YOU ROCK!!! If I won the embossing kit I would want to learn how to make cards! this is SOOO cute! the circles are really great - they add just enough detail to the title without distracting from it! if i won the embossing kit, i think my favorite thing to do would be emboss vellum... i LOVE doing that! Amy! Love the new layout. I want to try the metal embossing and such that you showcase so much of. I have a 3 year old grandson (soon to be my son!) that I am starting a scrapbook on and the things you show would be so cool to do in his book! Thanks for the great inspirations! I would love to win this great prize! Super cute LO. If I won the embossing kit ~ i would use it to make all kinds of images for my cards and lay outs - i love how vellum looks using it. thanks for the chance! Great layout! I already have your embossing kit, and love it. I'm off to google Ten Seconds Studio, and order myself some metal sheets. Thanks for the inspiration! I have been thinking I would love to try embossing for tags and cards, but I love your 'Crazy Kid' layout! Thanks for your inspirations on your blog! Very nice LO. I think I'd use the embossing on cards since I seem to make a lot of cards. I would get over my fear of trying something so different for me and give it a whirl! I just received my embossing kit and love it! If I were to be the winner, I'd send one to my very good crafting friend who recently moved to AZ. We still craft together via Skype and I'd love for her to have this tool too! This is the best blog candy EVER! I would definitely use it to embellish some manly pages for my husband. You know "man" pages are even harder to embellish than "boy" pages! They just don't look right with flowers and stickles on them! I'm always interested in new ways to create a title for my LOs. I would use the embossing kit to do just that! Wow, I love your layouts, they are very cool and gave me some ideas for l/o's for grandson. If I won the kit I would def learn how to emboss better and use them for my cards and layouts. very nice Amy. I love the "Train to though!!!!! oh duh, let's see waht would I do with it? well emboss of course!! I think dog tags would be COOL!!!!!!! Hmm, what would I do with the embossing kit if I won it? I'd be sure to run over and first get some of the metal things that you mentioned and then do some Halo-ish things for my DS. DD would have me make Pokemon things as that's what she likes..and wouldn't they just look totally awesome in metal!?!? Thanks Amy for a chance to win..
Oh, I just love the embossing kit. I love the look of embossed paper and hate that I am limited to the size of the cuttlebug folder. I would also love to try out the metal sheets. Emboss the kids! Wait . . . wrong answer! It would actually get me back to scrapping! lol I haven't done much lately but that looks AWESOME! It makes me want to scrap! OMG! THis is the first I've seen metal used with the Cricut embossing kit. In fact, it's one of the few places I've seen highlighting the embossing kit. If I got it, I would probably try out the metal to add to cards. I really like the train you made. THANK! I would use an embossing kit to add more dimension to my pages! I'm always looking for the latest and greatest with Cricut and this is it! Wow Amy! If I won the embossing kit I would use it to help my daughter's sorority fundraising phianthropy - breat cancer awareness - they raised over $125,000 in a week last year from other college students!! I would help them make their marketin material standout by embossing their greek letters and pink ribbons for their posters! ~ Ruthgillis61 from MTC Forum! I'm not sure how I initially found your site but I've been scrapbooking for about 6 months and I'm already hooked. I really love what you do with your embossing kit. It gives your pages that extra dimension. If I won the kit, I know that my next dozen pages would have to have some embossing to jazz up the pages. It looks like so much fun!!!!! It was so nice meeting you at CHA! What happened to "Baby Jack"?! Wow, has he grown! I love the colors and textures. Great job. Great LO!! I really like the train. If I were to win I would use Life Is A Beach to make a shell folder to emboss on metal for my anniversary pages about our trip to Tofino. Very nice LO!! 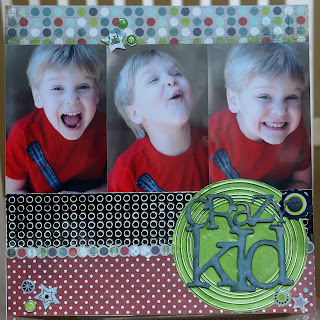 I would love to win the embossing kit! I would use it to emboss images on aluminum foil. I took a class a long time ago in Mexico on how to emboss aluminum foil by hand using a bunch of tools. I love the end result but it was very time consuming. Thanks for the great giveaway. LOVE what you did with the metal.. it looked awesome on the page.. I need to emboss a metal rocket ship that my son made in 4th grade.. it was made of paper towel rolls and tin foil.. this technique would look awesome on the page.. thanks for sharing "candy"..
What would I do with the embossing kit? I would make little metal "license plate name tags" for my children. 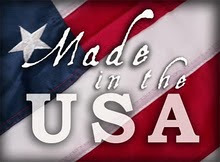 Use them in scrapbooks, on school back packs and lunch bags, hang them on their doors. I would probably develop a slight addiction to those metal sheets. Those look awesome! I guess I would use it to figure out how to use the cricut with embossing. I am clueless! I would definitely do LOs and cards. I'd love the embossing kit! I have all your other holders but am on a spending ban :( I think I'd most use this for embossing on metal like the examples you show, that is such a neat technique! I would love to emboss a 12 x 12 sheet of paper! Maybe an all over lace pattern! Thanks for the drawing. Your page is so cute. I love to add emobssing to cards. They really add a professional, fabulous look. It helps to draw attention to a specific area. I would love to win. Thanks for the chance. Oh wow! The embossing looks amazing! I would love to make unique custom embellishments for my cards and layouts! So beautiful! This is awesome! I love the Dr. Suess! I'd use that on my Universal pages! love the embossing tip. I keep thinking I don't NEED one, but I sure do want one. If I won the embossing kit, I would first use it for my scrapbooks of my beautiful daughters adn families--and I would be running to my next monthly crop with the tip in hand. I know that some of my cropping buddies would love to see it in action. AND I'd probably be teaching a class about the embossing tip at the next fall retreat in October (haha!). I love this Amy it looks awesome!! Thanks for the blog candy, my fingers are crossed!! oh my gosh you are so good at this . I am so impressed with what you can do with the cricut, metal and the embossing kit. I would love to have an embossing kit! I still haven't done my wedding album and I would love to and metal accents maybe resembling lace to some of my pages. Metal flowers would be awesome too! thanks for the chance to win! Wow! I love that Dr. Seuss metal embossing that you did! The details on that and the train in your newer layout are amazing! I would love to use the embossing kit to make Paul Frank and friends metal embossed pieces for my son's scrapbook! Thank you for the chance to win! This is like a blast from the past for me, we used to glue string down and then use the heavier foil on top and go around the foil to make it look embossed, I've also used the sticky flashing tape and punched cuts to have it look embossed WOW so much easier, LOL! I would love to try it on the metal sheets, how fun and thanks for sharing and good luck to all! I would love to use the embossing kit on my lay outs of my two kiddos. Amy I love your LOs. thank you for your inspiration and the chance to win blog candy. The metal embossing is fantastic!!! I would use the embossing kit for making my cards. Thanks for the chance to win! Amy I love your work. The layout is great. Jack is really growing fast. I loved the tain you embossed also. If I won the embossing kit I would be embossing everything I could get my hands on. I would use it conjuction with MTC. What you have done with your cricut embossing tool and tape is utterly amazing, inspiring, and makes me want to race out and buy all supplies. Unfortunately things are a bit tight right now so I'm spending the time planning projects. Probably some of the first things I'd try would be the intricate embossing (like your train image) on candle sleeves as I think these would be beautiful for gifts. Love your Layout! That embossing is amazing. I would love to use it for my daughters upcoming wedding photos. Thanks for a chance to win. 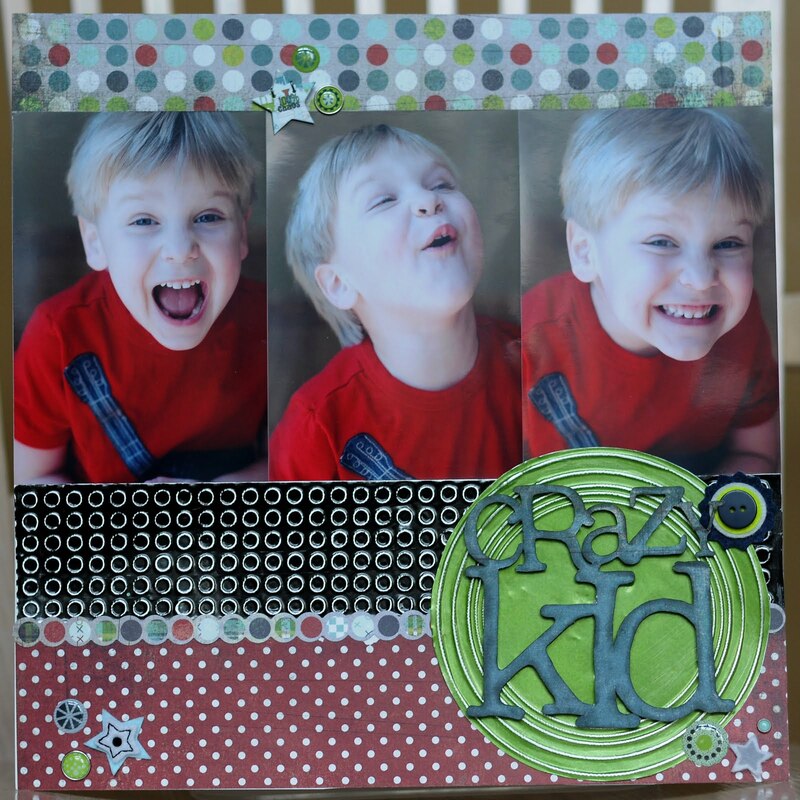 I would be using the kit to add embossing to my scrapbook pages. Yours are so wonderful!! Thanks for the chance to win!! Great LO thanks for the candy! I absolutely love your layouts Amy!!! If I won the embossing kit I would be detailing so many layouts and cards that my kids would get tired of saying Cheese!!...lol. Love all your stuff. I love the way the embossed metal just pops off the page. This is definitely something I need to try.